I have a confession to make. I am a vegetarian that is rather lazy about eating raw vegetables. How hard can it be to make and eat a salad, really? Well, when you think about prep time and chew time it can actually take quite awhile which is no good when you are in a hurry. 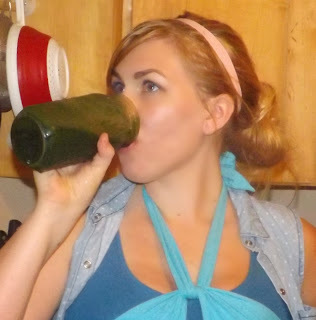 Thankfully there is a wonder drink called the green smoothie that can help you consume large amounts of raw veggies and greens without even thinking twice. Green smoothies and I had a rather rough beginning. I really didn't like them at first. Months later I read more about the great health benefits of green smoothie consumption (detoxification, weight loss, regularity, clearer skin...) so I decided to try again. I found out that I was making my greens all wrong. Too many fruits and not enough veggies. Now that I have upped my veggies and subbed juice or water for the original nut or soy milk I can honestly say that I look forward to my green smoothies! Here is my new green smoothie recipe. It is far from exact, but it is what works for me. The key here is to find your favorite mix of veggies and fruits. If you don't like the first one you make, try try again until you find your perfect mix. Your body will thank you. Step 1: Select veggies and fruits. Aim to use about 70% veggies and 30% fruit. Try to include a large amount of greens and use fresh greens, never frozen. It is okay to use fresh or frozen fruit. Fresh is more nutritious but I like to use organic frozen fruit since it chills my smoothie for me. If possible buy local and organic. In today's smoothie I'm using Spinach, green lettuce mix, frozen mango, frozen papaya, spirulina powder, wheatgrass powder and a little bit of lemonade to cut the strong smell and taste of the greens. Step 2: Prep and Wash your fruits and veggies. If you only have a regular blender it helps to cut them into small pieces but you can press a whole cucumber into the Vitamix. 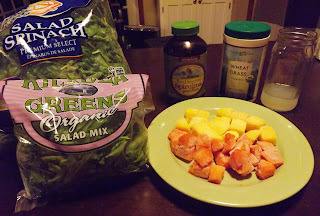 Step 3: Pack greens into the bottom of the blender. I usually fill it about 2/3 of the way. Step 4: Add water, juice, your choice of milk or a mix of liquids. Fill the spaces between the greens with liquid, I use mostly water. 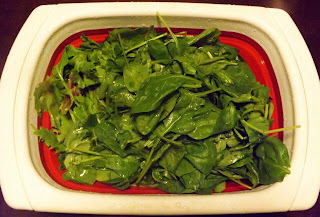 Add some lemon juice or lemonade to neutralize the spinach taste. Step 6: Add fruits and veggies of choice. Step 7: Blend. Start on low speed and gradually move up to high speed. Once things are moving well turn the high speed switch on. If anything gets stuck, turn the high speed off then gradually go down to medium speed and then gradually work back up again. This is just what works with my blender, may be a bit different with yours. Step 8: Strain (Optional) If you find that your smoothie is too pulpy or thick to stomach you can easily strain your smoothie drink using a nutmilk bag, unused paint strainer or cheesecloth. This separates the pulp from the juice and makes it more palatable. It is good to leave the pulp in because it adds extra nutrients and fiber but I have found that when I add pear or apple I prefer to strain it because I don't like the texture. Here's Kristen's Raw recipe for Plant Blood which is the strained smoothie recipe that gave me this idea. Saved quite a few smoothies for me! Step 9: Enjoy! 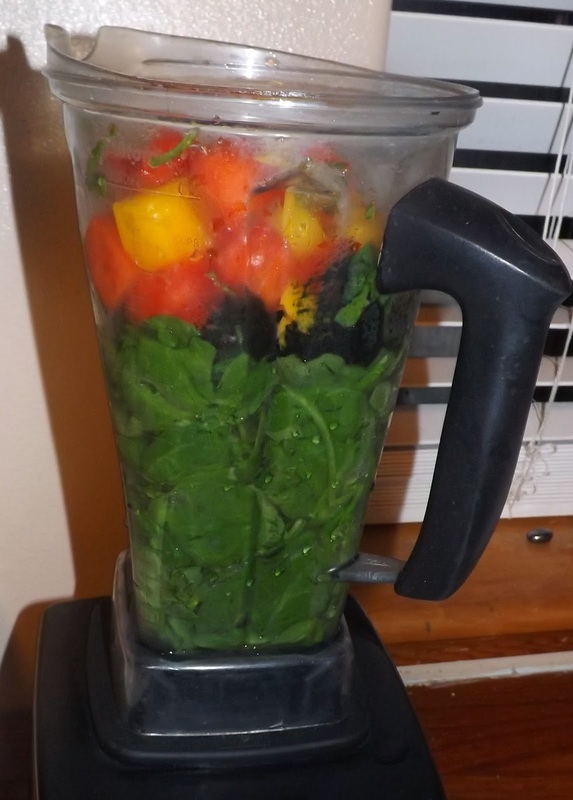 It is best to drink this smoothie right away when the nutrients are ready to be absorbed into your system. I have to be honest, I chug this smoothie to get it down! I do not recommend sipping it. It will probably smell weird, especially if you use lots of spinach. If it bothers you, or if you made it extra green just hold your nose. I've done this before :P. Although they smell and look weird I actually crave them now! For more information about the health benefits of green smoothies check out Kimberly Snyder's recipe for Glowing Green Smoothies (GGS). They are a staple in her Beauty Detox diet. She even got the Avenger actors to drink them on set. I thought that little factoid would convince my dad to try them but no such luck. Thankfully my hubby and mother are big fans, we are all converts! Phew, that was a long post! Have you ever tried green smoothies? If not, would you ever? Maybe I'll try one at some point... my blender is just so loud. Like a jet engine.